"In a field site, you inject the carbon dioxide in, and it's a very open system," Giammar said. "You can't get a good constraint in terms of a capacity estimate. You know you made some carbonate from the CO2, but you don't really know how much. In the lab, we have well-defined boundaries." "We reacted it at similar pressure and temperature conditions to what they had in the field, except we do all of ours in a small sealed vessel," Giammar said. "So we know how much carbon dioxide went in and we know exactly where all of it went. We can look at the entire rock afterwards and see how much carbonate was formed in that rock. " "People have done surveys of available basalt flows," Giammar said. "This data will help us determine which ones could actually be receptive to having CO2 injected into them, and then also help us to determine capacity. It's big. It's years and years worth of U.S. CO2 emissions." Giammar's lab is currently sharing its results with colleagues at the University of Michigan, who will assist in developing a computational model to further help researchers to look for a solid fix for CO2 abatement. 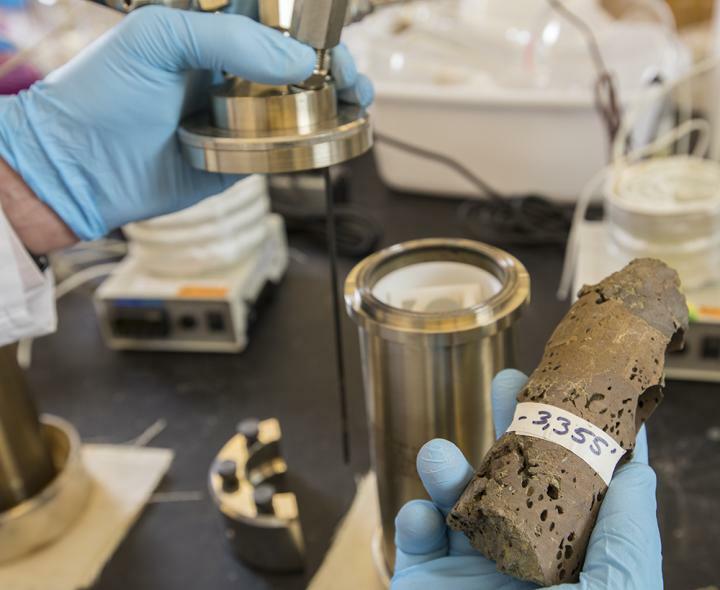 The Washington University researchers have also been invited to take part in the second phase of the U.S. Department of Energy's Carbon Storage Assurance Facility Enterprise, or CarbonSAFE, which investigates new technologies for CO2 abatement.